"A small person falls, you help them up. 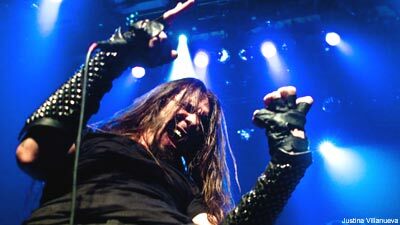 Anyone falls, you help them up and keep it f---ing moving," Goatwhore vocalist Benjamin Falgoust demanded Oct. 24 when they played Gramercy Theater with Obituary. This was part of Falgoust's Judas Priest circa 1982 concert ethics speech (he gives it often). With the greatest determination to make everyone an active part of the show, the long-haired frontman raised his fist. Everyone followed (this also happens often for the band). Goatwhore tour relentlessly, like many other bands. Despite them always being on the road, many people want to see them all the time. In 2009 alone, this writer has seen them three times and they've certainly been in the New York City area more than that. They continually play a flawless and energetic show that you just can't get tired of experiencing. To add, the Southern blackened death metallers are returning to New York in less than three weeks. Lucky New Yorkers and CMJ convention attendees have one of the coolest metal show opportunities of 2009: three hours of live extreme metal on a boat. Eyehategod, Pig Destroyer and Strong Intention will join Goatwhore to create a catastrophic whirlpool in the Hudson River on Oct. 24. If you think you haven't seen enough of them, I'm sure their most recent release, 'Carving out the Eyes of God,' will be on every end-of-the-year top albums lists across the metal media board.